Manisha Desai is Professor of Sociology and Asian and Asian American Studies at the University of Connecticut. 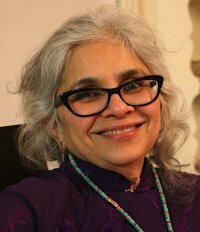 Committed to decolonizing knowledge and social justice, her research and teaching interests include Gender and Globalization, Transnational Feminisms and women’s movements, Human Rights movements, and Contemporary Indian Society. My other project examines Student Protests and the Decolonial Imaginaries of Social Justice in India, South Africa, and the United States. I propose that given their challenge to the ongoing physical, structural and epistemic violence that continues to mark marginalized bodies in postcolonial society (in the case of India) and settler colonial societies (in the case of South Africa and the United States), these struggles can perhaps best be understood as decolonial struggles. And unlike the earlier decolonial struggles for independence in each country that sought to become part of the “modern” world, these struggles interrogate the very logic of modernity/coloniality that continues to shape the current neoliberal and global conjuncture. In so doing, as Mahatma Gandhi noted, they are perhaps seeking to decolonize the colonizer rather than the colonized. Additionally, I am completing a book on Women and Gender in a Globalizing World for Routledge’s Global Studies Series and papers on Beyond Citizenship: New Geographies and Ontologies of Belonging; Feminism and Epistemic Justice; Decolonizing Feminist Praxis, and Gender and Precarity in the Neoliberal Era. My most recent book is Subaltern Movements in India: The Gendered Geography of struggle Against Neoliberal Development (Routledge 2016). Based on nine months of ethnographic research, funded by Fulbright Hays Faculty Research Abroad Fellowship, I analyze three subaltern movements by adivasis (indigenous people), farmers, and fishers against “development by dispossession.” I show that the movements succeeded because of the deepening of democracy in India, albeit in tandem with coercive state initiatives, but gender remains a challenge for the movements, the state, and social theory. Drawing upon innovative perspectives in social-legal studies, critical geography, and feminist studies I define several new concepts to show how ongoing relationships among various local fields of protest enabled activists and advocates to use legalism from below to exploit the changing legal architecture of the Indian state and to win substantial victories for subaltern groups. Among my other books are: Gender, Family, and Law in a Globalizing Middle East and South Asia (co-edited with Ken Cuno, 2010, Syracuse University Press); Gender and the Politics of Possibilities: Rethinking Globalization (2008, Rowman and Littlefield) and Women’s Activism and Globalization: Linking Local Struggles to Transnational Politics (co-edited with Nancy Naples, 2002, Routledge). I was the 2015 Sociologist for Women in Society’s (SWS) Distinguished Feminist Lecturer, an award that recognizes a body of feminist scholarship that has made important contributions to further our understanding of Gender. I hold and have held several elected offices in the International Sociological Association, American Sociological Association and SWS, including President of SWS in 2007, and serve on numerous editorial boards including American Sociological Review and the International Feminist Journal of Politics. My commitment in all these offices has been to bring in voices from the Global South and marginalized communities in the Global North to engage in a critical public sociology that is centered around social justice and a critical human rights perspective. For example, as President of Sociologists for Women in Society, I organized the annual winter meeting in post-Katrina New Orleans and brought together local activists working for justice with women activists from India, Nicaragua, and Florida who had worked in post-disaster situations to share knowledge and experiences of rehabilitation when natural disasters reinforce existing social inequalities. As a scholar activist, I have been involved in advocacy and activism around social and gender justice issues at the United Nations, as SWS’s Representative to its Economic and Social Council, at the World Social Forum, and US Social Forum, among other sites. I was recently invited to serve on the Expert Special Committee of Everywoman Everywhere, International Commission of Violence Against Women and Girls, to work on a Global Treaty on Violence Against Women and elected to the Leadership Council of MayFirst/PeopleLink, committed to strategic and collective use of communication technologies for local and global struggles and transformations. Committed to buen vivir, I’m also a trained yoga teacher and practitioner as well as a trained Indian classical dancer in the Bharat Natyam style.